Winship Deputy Director Suresh Ramalingam, MD, first met Paul Bunn, MD, at a scientific advisory board meeting 15 years ago. "He is one of the most influential leaders in the international lung cancer scientific community," Ramalingam says. "I consider him to be a mentor and a trusted colleague." 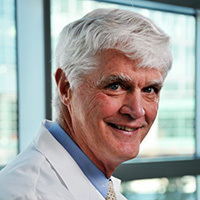 Bunn, who is a founding director of the University of Colorado Cancer Center, is a past president of the International Association for the Study of Lung Cancer (IASLC) and the American Society of Clinical Oncology (ASCO). He also served as chairman of the FDA Oncology Drug Advisory Committee. "Dr. Bunn's work has led to several important advances in the treatment of lung cancer. He deserves a ton of credit for bringing personalized therapies to the forefront. He is also responsible for growing the IASLC to become a highly impactful, multidisciplinary organization that includes researchers and clinicians from all over the world," Ramalingam explains. "Dr. Bunn has been a great friend of the Winship Lung Cancer Program," says Ramalingam. "He has served on our External Advisory Board for over a decade and has been of immense help in steering our research. His ability to bring people from different spheres together to work on common goals to improve outcomes for patients is unparalleled."